French Roast is Starbucks darkest roast of coffee. This special blend Latin American coffee beans by Starbucks is intense, smoky and adventurous. 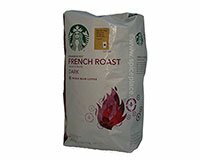 Starbucks French Roast is a light-bodied, low acidity coffee with an intensely smoky flavor. For best flavor, grind beans just before brewing. Use a medium grind in a drip coffee maker, and a fine grind for expresso. Use fresh, filtered water. Packaged in a FlavorLockTM package. Starbucks Coffee and Doughnuts More Recipes..